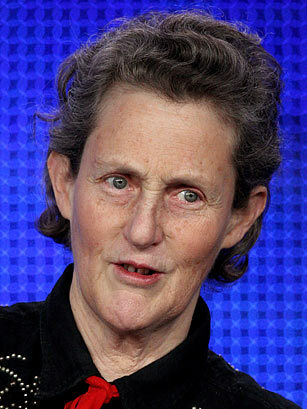 Time.com honors Temple Grandin, professor of animal science, author and speaker, inventor, a prolific advocate, and person with autism. She is voted #31 as 2010 Time Most Influential People and is a Time 100 Hero, sharing the list with former US President Bill Clinton; PGA Champion, Phil Mickelson; Freedom Fighter Graça Machel comedian, and actors Ben Stiller and Jet Li. Click here to go to the full list. “Temple is a symbol of how much an autistic person can achieve,” according to Time staff. The Time 100 is an annual poll that name people who most affect the world. Her colorful life has been made into a biopic by HBO. Click here to read our previous post on Temple. ***If by some magic, autism had been eradicated from the face of the earth then man would still be socializing by the wood fire, at the entrance to the cave. ***Ok guys, who do you think made the first spear/arrows? An Asperger Guy! ***If you were to get rid of all the autism genetics, there will be no more silicon valley and the energy crisis will not be solved. ***I’m passionate about that the things I do are gonna make the world a better place. “Living on this edge has allowed her to be an extraordinary source of inspiration for autistic children, their parents — and all people,” says Marc Hauser, Harvard University. Click here to read his full article.